Everyone in the perfume world bristled at Estée Lauder’s recent claims that Modern Muse was its first major launch since Beyond Paradise. They may want us to forget about Sensuous, but we haven’t! Today, Elisa revisits Sensuous and its two flankers. Sensuous (2008) is one of those rare perfumes that is not (quite) as good as its flankers. It’s almost as though Estée Lauder designed the pillar with the flankers in mind – it’s a stripped down skin scent practically begging to be layered or embellished. But simple or not, Sensuous is exceedingly comfortable and well done. It doesn’t have a pyramid-style development, just a fairly linear balance between soft white floral notes (jasmine and lily), warm woody notes, and a citrusy white musk. (Note, however, that anything with vanilla smells more vanillic as it dries down.) In classic Estee Lauder style, it radiates good taste – there’s a daytime-appropriate freshness you rarely see in amber fragrances, and the sweetness is restrained, never verging on gourmand. Elisa questions whether Estée Lauder’s Modern Muse can be her inspiration. I am a longtime fan of the Estée Lauder lineup. 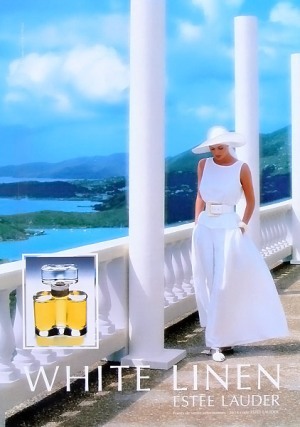 The first perfume to take my breath away was White Linen – my grandmother wore it, and one day (I was 12 or 13) she let me use a dab of the lotion from her purse. The scent rushed up at me like a blast of cold air, snow blowing into a hot room from an open window. I stood there smelling my hands in awe. From the get-go, Modern Muse smells very Estée Lauder – fresh, feminine, floral, and bright, pretty in a grown-up way, without the over-sugared sweetness of so many recent launches. There’s a crisp, leafy-green top note and a touch of juicy citrus, more like tangerine than dry, tart bergamot. These effects are layered over what the press materials call “dewy petals” – and yes, there is a petal-like feel to the floral accord, a white bouquet of lily, with its distinctive waxy, vanillic notes, plus raspy jasmine and orange blossom.